In the picturesque Cotswolds village of Chipping Sodbury there stands a bakery with a butcher’s shop next door. The bakery was established in the 1920s and there has been a butchers’ here for about 100 years – quite unusual perhaps these days where there are more convenience stores and supermarkets than independent food producers on the high street. 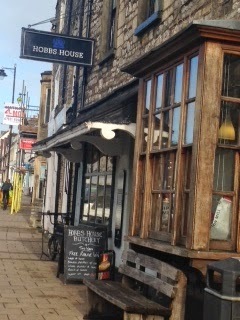 But this is not just any bakery or butcher’s – this is Hobbs House, the family business of Tom and Henry Herbert. Tom and Henry – two of six siblings – are perhaps better known as the Fabulous Baker Brothers, thanks to their television show and cookery books. Despite their young age – Tom is 35, Henry 25 – are old hands. Henry has been cooking since he was a teenager and Tom won Young Baker of the Year when he was fresh out of college. Henry moved to London where he trained at Westminster Kingsway College and worked at Le Gavroche, the Michelin-starred restaurant, but when an opportunity came up to run the butcher’s next door to his brother’s bakery, he moved back to the Cotswolds. Since the success of their TV show and cookery books, the brothers have started running cookery courses at Hobbs House, and it’s for this reason that I found myself standing on the pavement outside with a suitcase on a drizzly April morning. My boyfriend knows that I am a big fan of the brothers and for Christmas bought me a place on one of their courses –the only one that the pair of them teach together. Having said that, when only one is teaching, the other is usually present and will pop in to the classroom now and then – so if you fancy doing a course and want to meet both brothers you will probably still get the chance! I was signed up to the baking and butchery class, which ran from 9am-4pm (though we actually finished at 4.30). It’s not cheap at £295, but it really is worth the money. There were only six of us and we spent the entire day with the brothers, and by the end I felt like they were old friends. The school is above the bakery – I’m sure I remember Tom saying this is the house they grew up in and one of the classrooms was actually his bedroom. As I went upstairs I bumped into Henry and had a moment of celebrity-awe, then Tom came over to say hello as well and started chatting. I’ve met celebrities- or at least well-known people – before so wasn’t expecting to be fazed, but when it’s someone you are genuinely a fan of, it is still a little overwhelming! I was shown into a room where tea, coffee and pastries were laid out and I ate the best almond croissant I have ever had – made by the Hobbs House bakery of course. I was joined shortly after by another attendee of the course and by 9, everyone had arrived – five women and one man. I was very jealous of a few of the women who lived half an hours’ drive away and one who had been to the school before – if London wasn’t so far away I’d be a regular! They came across as really genuine, passionate about what they do and thoroughly nice guys. Before I realised, an hour and a half had flown by – by this point Tom was making some bread dough, explaining each stage in the process, giving each of us a specific tip to remember and passing on all sorts of advice on everything from types of flour to the advantages of fresh or dried yeast (dried yeast is fine, but never use the fast-acting kind as it is full of chemicals, which will change the make-up of your recipe, Tom said). Often when I am doing a cookery course or cake decorating lesson, I would feel short-changed if I was watching rather than doing anything. But in this case, I was so fascinated listening to Tom – and looking at him as well, as he is rather easy on the eyes – and was learning so much I didn’t notice that I wasn’t actively doing anything. Then it was time for us to get involved and we were put to work each kneading a piece of dough – for 15 minutes. I haven’t made bread very often before, usually using my Panasonic bread maker machine, but when I have made it by hand, I get bored or tired after just a few minutes of kneading. Tom stressed the importance of a full 15 minutes, and shared a tip – when covering the bowl when you leave the dough to prove, use a cheap plastic shower cap like the kind you get in hotels. That’s better than clingfilm as it gives the dough space to rise. I asked Tom where to leave the dough as the usual directions of “a warm place” aren’t very helpful; I know you can get kitchens these days with built-in proving drawers and I asked if those were needed. “Yes, there is a need for them,” Tom began, “if you are a kitchen company trying to sell an expensive kitchen”. So in other words, no. Any warm place will do – unfortunately I can’t put my dough next to an open fire like Tom did, but I could put it in the airing cupboard or even out in the kitchen if it is a warm day. On top of the fridge is another idea as that tends to be quite warm too. We rolled out our dough to make pittas, bread rolls and pizza bases, and Tom also demonstrated making a focaccia. One handy trick I learnt if you are making a batch of rolls or pittas is to weigh your dough into 100g portions then they are all the right (and same) size. I've never made pittas before and was interested to learn that once they are rolled out, they literally need just a couple of minutes in the oven, at the highest temperature your oven will go to. We watched them puffing up before our eyes, sliced into them and dipped them into some of Henry's homemade pesto - absolute heaven! I also learnt that you should never put bread onto a cold oven tray; always preheat it in the oven or better still, use a baking stone. I'd never heard of that but asked if it was similar to a pizza stone and Tom said it was the same thing but a different shape. So I will definitely get more use out of my pizza stone now! We also rolled out circles of the same dough to make pizza bases; Tom demonstrated how to toss and catch them. We then topped the pizzas and cooked them in this free standing mini pizza oven with Henry's help. This was our lunch, accompanied by a glass of wine and eaten as we chatted to the brothers. After lunch it was Henry's turn to take centre stage. He wrote a few rough recipes on the blackboard and explained what we were going to do... if you're squeamish about butchery you won't like the next few photos. Then Henry took us down to the slaughterhouse and gave a very useful lesson in the different cuts of meat, by pointing to a side of beef and a whole lamb (well, minus head and innards) hanging on butcher's hooks. He then took a lamb over to the table and proceeded to joint it completely, explaining as he went how to make a rack of lamb, which cut is best for which dish and so on. It was very interesting and Henry is clearly passionate and very knowledgeable about butchery. He asked for a volunteer so of course I put my hand up. Here I am (in an unflattering apron) about to joint a leg of lamb. When we came back upstairs to the school, our bread rolls and focaccia were ready. Mmm, very tasty... the loaf of bread looks good too! Henry had prepared these lamb chops from the animal you saw in the photo earlier and we coated them in the spice rub. We were meant to be making lamb kebabs from neck and shoulder but a woman came into the shop and asked for the last shoulder just as Henry was about to start his demonstration, so rather reluctantly he sold it to her instead! We were making sausages and burgers which I was really looking forward to. I've made burgers several times before but never sausages. I have a Kitchenaid and have several attachments apart from the sausage maker, and was wondering if it would be worth investing in, but had no idea how to use it or how to go about stuffing a sausage. Luckily, Henry was using the exact same machine (well, almost- his wasn't pink) so now if I do get the attachment I know exactly how to use it. Don't ask what the sausage skins are made of though! Stuffing the sausages is a two-person job but it was easier than I was expecting and lots of fun. Here's my string of sausages. I flavoured my lamb mince with some herbs and spices. Meanwhile we also made burgers by pressing a ball of mince into patties. Tom cooked them over an open fire. At the end of the day - well, 4pm - we sat down to the most delicious meal. The burger buns were perfect and the burgers so juicy. I'm not sure what kind of cheese we had melted over the top but I was in heaven. We also had the lamb chops, sliced up, with the focaccia and salad. At the end of the day I went on my way with a folder of recipes, a bag of leftover fresh yeast, a Hobbs House dough divider, my string of sausages and a burger to cook later at home, a signed cookery book (my own, which I had brought with me to be signed), a loaf tin for making bread (a large metal one the same as the one Tom was using), a bag of Shipton Mill flour (from a local mill, that they use in the bakery), loads of photos and many happy memories. Tom and Henry are thoroughly nice blokes, so easy to get along with that I envied their friends (and yes, their wives)! Their enthusiasm and passion for cooking is wonderful and it felt like this was the first time they had run this class - not because they were unsure of themselves or amateurish, quite the opposite, but because they were so excited and when one brother was taking the session the other kept popping in to see what was going on or help or just to stop and chat, which I really wasn't expecting. In short, I had a wonderful day and strongly recommend this class, which is well worth the money. I'm already hoping to go back! Looks like a great course - I skipped the meaty pictures I'm afraid - but would love to do a bread course. I don't know if this will surprise you, but I detect a very SLIGHT crush you might have on one of the brothers! Am sure he didn't realise ;-) Great write up, thanks! expensive--.sounds like you had a good time and learnt lots.